A manufacturing cell can reduce part transportation because the close proximity of the cells resources makes part transportation almost non-existent. Flexible automation is the ability for a robot or system to be quickly and easily re-tasked to change product design for both low and high mix manufacturing. When properly utilized, a Flexible Automation cell can evolve with a manufacturer’s process and demand, reduce, and fix production costs, improve quality, and eliminate health and safety issues. Flexible automation is quickly leading Fork Truck Free adoption among manufacturing companies throughout North America according to Ed Brown, founder of Topper Industrial. Even at the lean microcosm, the simple task of moving product within a manufacturing cell rather than calling, waiting, and using a fork truck is driving huge adoption of new technologies. Excess inventory is a result of the waste of overproduction. It is also one of the costliest of all manufacturing wastes. 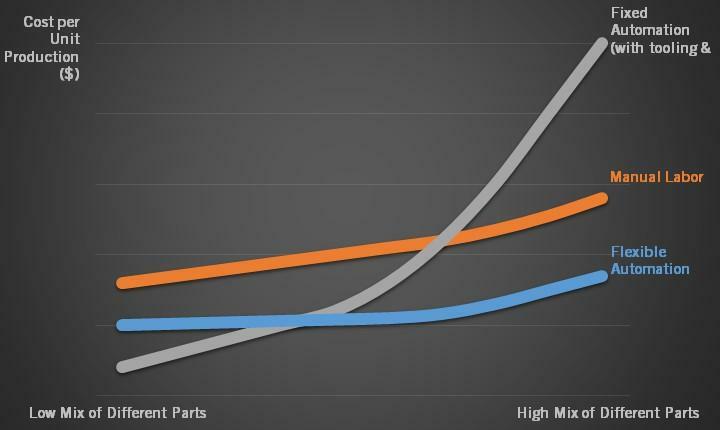 Manufacturing cells address the issue of inventory waste in a number of ways. First, by balancing the work and instructing operators not to exceed what the next person can handle, the work-in-process inventory is reduced. By the nature of the cell layout, excess inventory cannot be tolerated because there is no place to put it. Manufacturing cells solve the vacant space paradox, which says the amount of vacant space is inversely proportional to the amount of time it is vacant. Processing a part more than is required to make it function properly is another form of waste. Cells address the waste of over processing through close proximity of all processes and the strategy of only making what can be used. Unnecessary processes such as packing and unpacking are eliminated because handling is reduced, and that which remains poses little risk of damage. Parts in the cells are processed sooner, so any of the other product protection processes can also be eliminated. The close proximity of all the operations makes it easier to identify the processes that are not adding value to the product. There is significant wasted motion in a typical manufacturing process. This often results from a poorly organized work area. By putting everything together in a manufacturing cell, wasted motion can be reduced, if not eliminated entirely. Eliminating travel to other areas to get parts is an obvious improvement, but what cannot be underestimated is the reduction of motion within an individual process. With a well-designed cellular operation, motion shifts from non-value added to value added. When emphasis is placed on conveniently locating everything that operators need to do their jobs, much wasted motion is eliminated. One of the most common causes of waiting is an unbalanced workload. Manufacturing cells can reduce waiting by supporting more synchronized flow. With all the required resources grouped closely together, synchronized product flow is easier. Worker flexibility within the cell will also help reduce waiting time because operators can help others when they are not busy. Transporting a part through the shop is a wasted effort. A manufacturing cell can reduce part transportation because the close proximity of the cell’s resources makes part transportation almost non-existent. As a result, material handling equipment can be reduced or eliminated altogether. Technology innovator Magline, best known for two-wheel hand trucks used in the beverage industry, has solved the heavy lifting problem in manufacturing facilities. 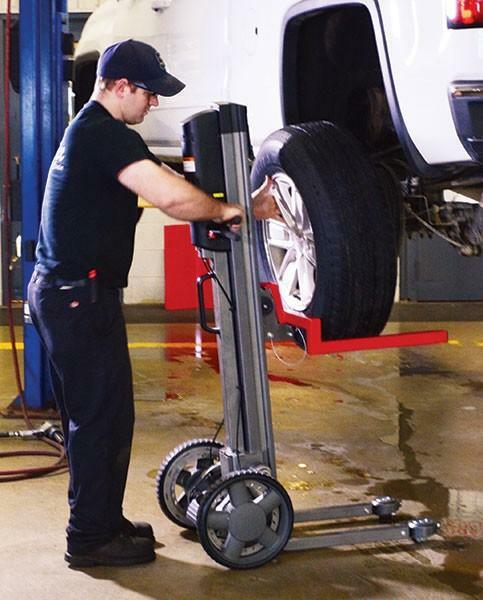 Magline’s LiftPlus provides an all-in-one lift, transporter, and positioner. The LiftPlus is a workforce multiplier that kicks in productivity with no need for special training or licensing. The LiftPlus was designed for ease of use, higher productivity, and to keep workers on the job and free from injuries; lifting 350 pounds easily with an all-metal frame platform and a screw-driven lift that delivers smooth precision that hydraulics or chains just cannot match. This is a level of robotics and automation frequently ignored, yet establishes immediate ROI and lean efficiencies.